Access All Areas members have a new collection of print design templates to download this week, courtesy of BrandPacks. 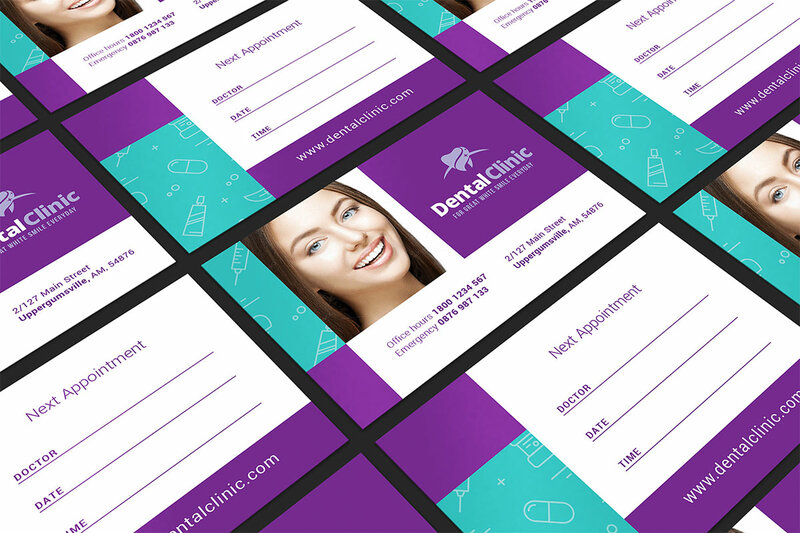 These ready made poster, leaflet, appointment card and flyer templates all have a Dental Clinic theme, but the clean and functional design could be rebranded to suit any business in the medical field. Each template comes in print ready Photoshop and Illustrator variants with completely editable text in a neatly structured and well labelled document. All stock images are also included, making it easy to customise the design to create a complete set of printed stationery and promotional material. This full collection of print design templates is now available for Access All Areas members to download. There’s 8 design files for various print mediums, each in a print ready 300ppi CMYK design file. All the design assets are included and the artwork makes use of freely available fonts, so you can quickly customise the designs to suit a variety of dental or medical businesses.